BOSTON, Mass. /Massachuetts Newswire/ — This past week (Jan. 6), Mass. 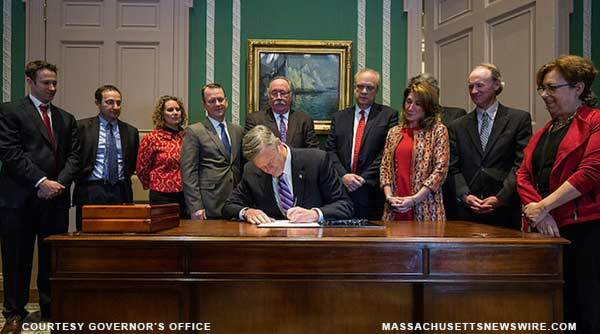 Governor Charlie Baker signed legislation to facilitate the transformation of unused state-owned land in Worcester into a site for biomanufacturing. An Act Authorizing the Transfer of Certain Parcels of Land in the City of Worcester to Promote Economic Development (H. 4774) authorizes the Commissioner of the Department of Capital Asset Management and Maintenance (DCAMM) to sell 44 acres of land at the Worcester State Hospital campus to the Worcester Business Development Corporation (WBDC) for the purpose of developing the site into a biomanufacturing industrial park. Photo Caption: Governor Baker, with Lt. Governor Polito, Rep. James J. O’Day, Worcester Mayor Joseph Petty, and others, signs legislation enabling Worcester biomanufacturing site. Courtesy the Governor’s office/website. The redevelopment of the land is part of the Commonwealth’s ongoing Open for Business Initiative that seeks to redevelop underutilized state assets into productive pieces of our state economy. At full capacity the new site will have the potential to create over 500+ well-paying jobs in Central Massachusetts. “This parcel of land had been looked at for a long time as a potential economic development engine and now, thanks to Governor Baker’s Open for Business initiative, we were able to set a great example of how local government can take advantage of underutilized spaces to generate revenue and economic development. This will bring initially 150 jobs to the city and the arrival of LakePharma can only mean good things for the city of Worcester moving forward. I’d also like to thank my colleagues in the legislature for such a swift passage of the bill,” said Representative James O’Day. “The Worcester Business Development Corporation has extensive local development experience and has successfully completed notable projects like the Massachusetts Biotechnology Research Park, Gateway Park, and Centech Park. The administration announced the “Open for Business” Real Estate Asset Leveraging (REAL) Strategy in October, 2015 which identifies unused or underutilized Commonwealth properties for redevelopment for affordable or market-rate housing, job creation, reduction in government expenses, increased revenue for the Commonwealth as well as local communities, capital investment in state properties, and open recreational space. Over 40 near-term opportunities throughout Massachusetts and across state agencies and authorities were first highlighted for public-private partnerships, of which 7 are currently under agreement.